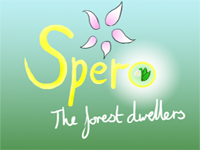 Spero: The Forest Dwellers is now out! Yes, it's finally out! I'm so sorry about the delay! The game will probably take less than an hour to complete (It's very short) maybe an hour if you want to go get all the endings.